Wist and I went along and saw Ethan Johns in concert last night. It finished late, but I thought I’d quickly slip in a food challenge nonetheless. large pack, for just shy of £1 sterling. I popped them in the fridge. Alas, the next time I was there they were out of stock. Tesco weren’t stocking them for some reason, and neither were Waitrose. 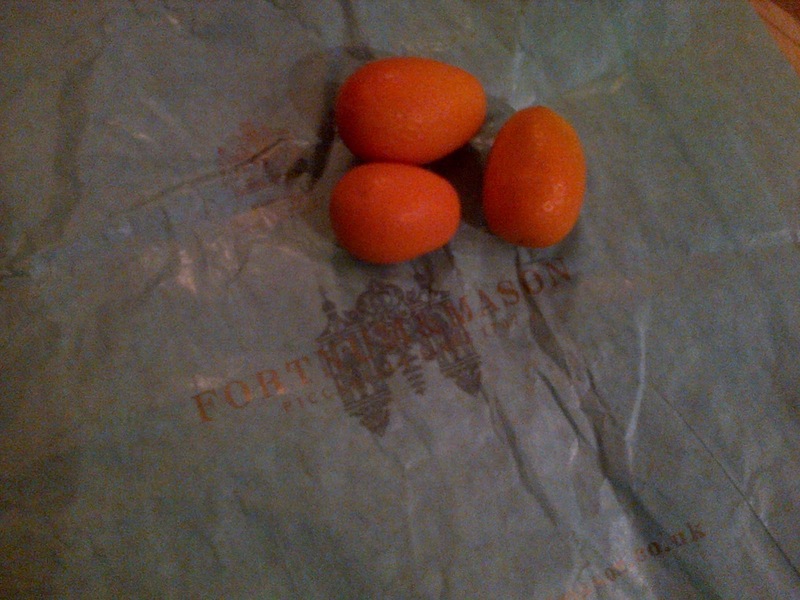 Fortnum and Mason as they have Kumquat marmalade. But marmalade didn’t need to count – Kumquat’s were still on sale in Fortnums! Sure they were £14 to the kg, but they were fresh and in the country nonetheless. We bought three whole kumquats. It cost just shy of a £1 sterling. And candied them as a post gig snack. They were pretty bitter – certainly needed the extra sugar I think. And I wouldn’t choose to have them again. But nice to have tried something new in the citrus family.